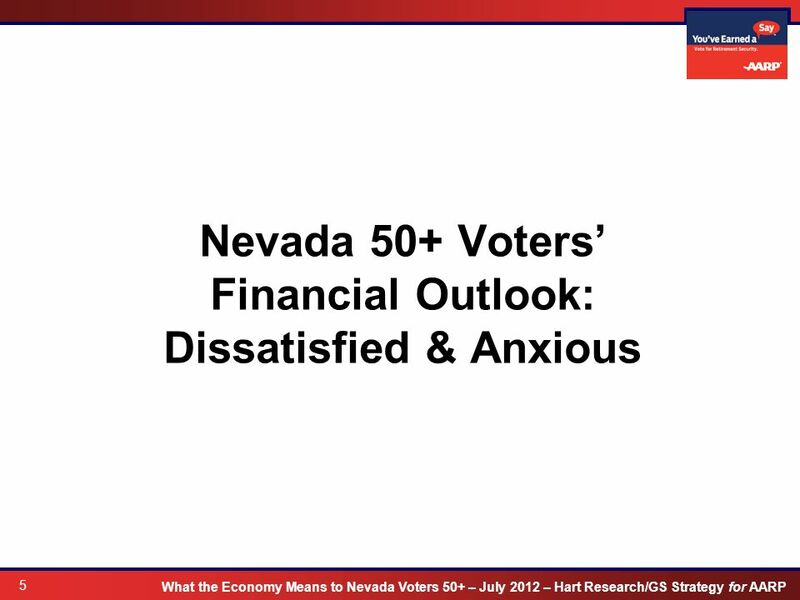 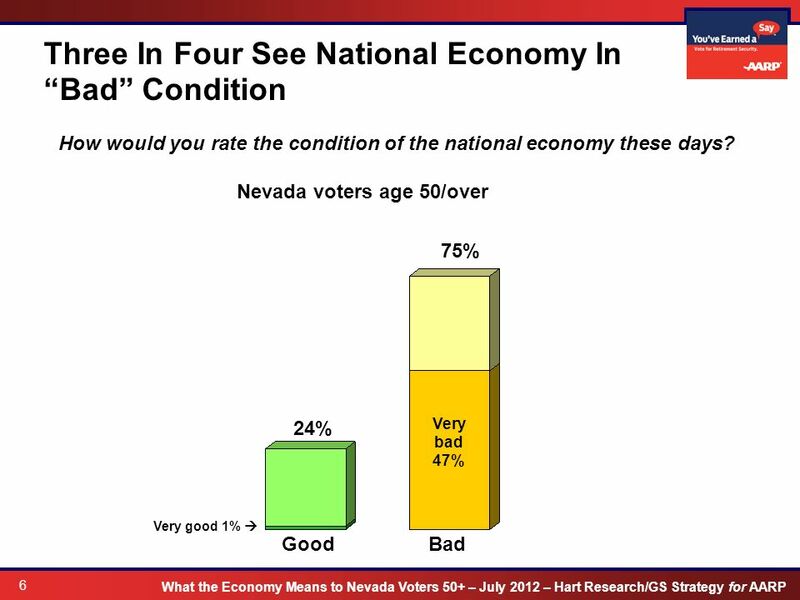 What The Economy Means To Nevada Voters 50+ Key findings from survey conducted July 2012 for HART RESEARCH ASSOTESCIA. 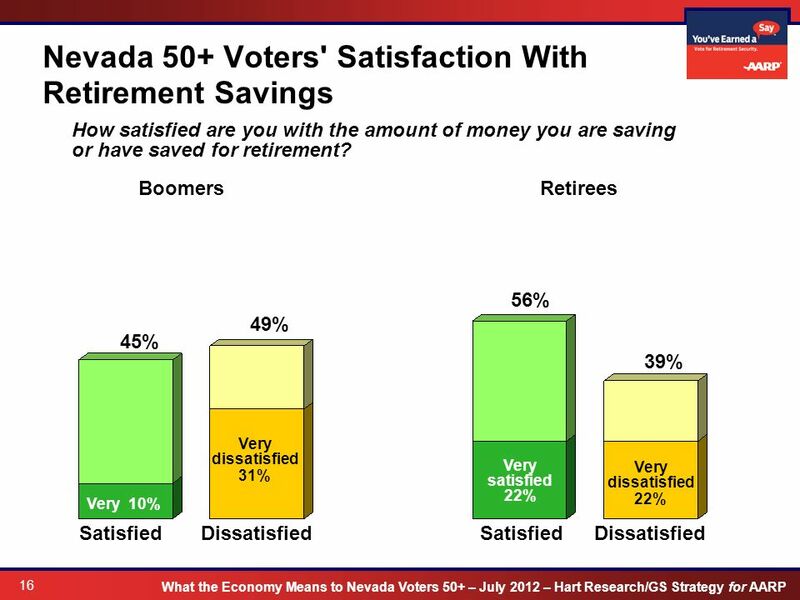 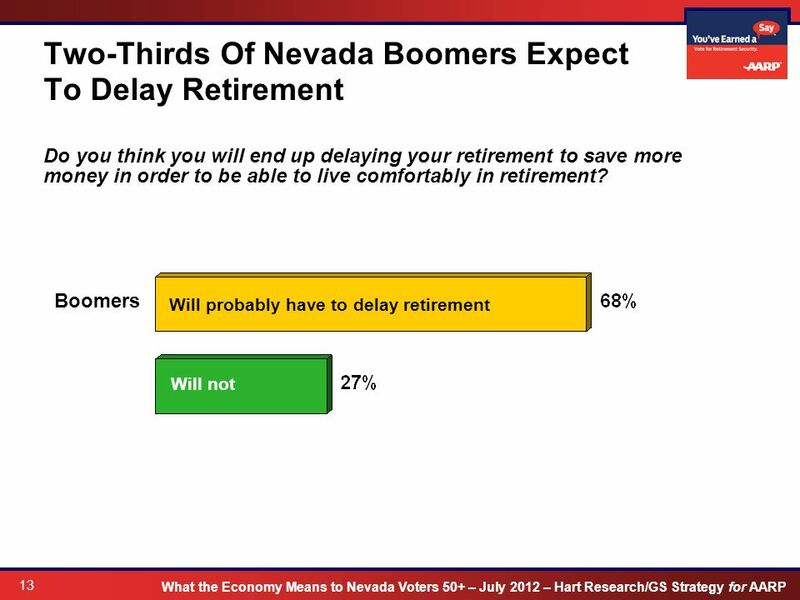 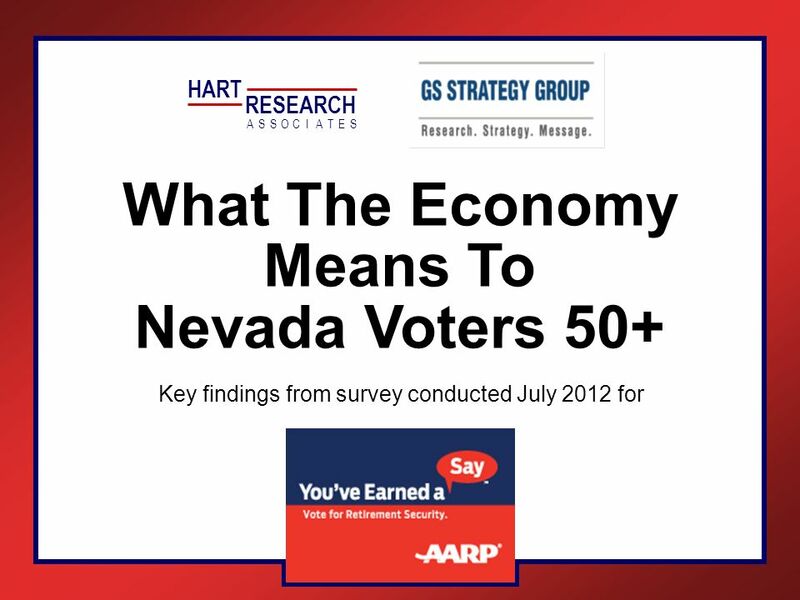 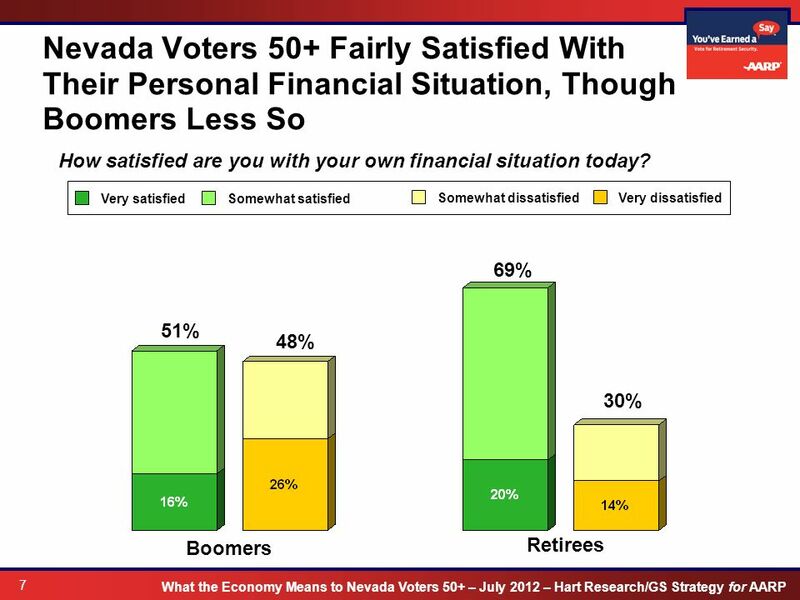 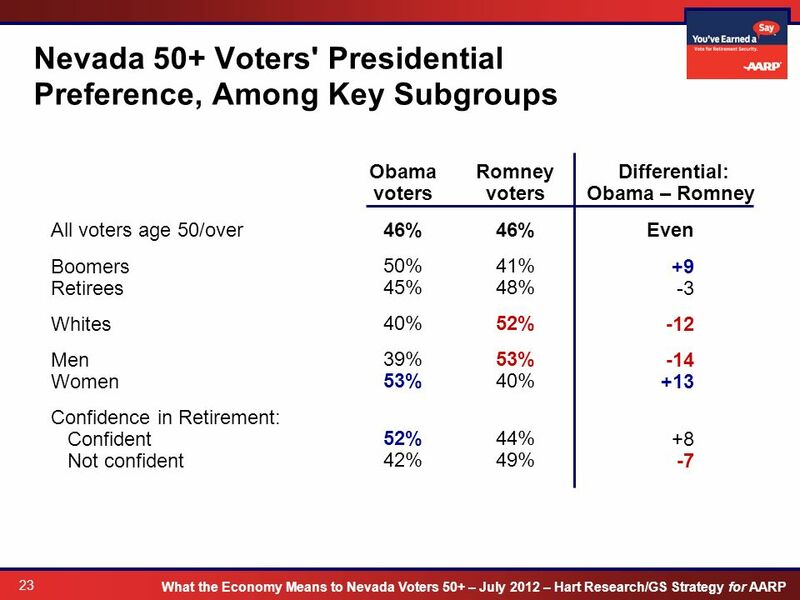 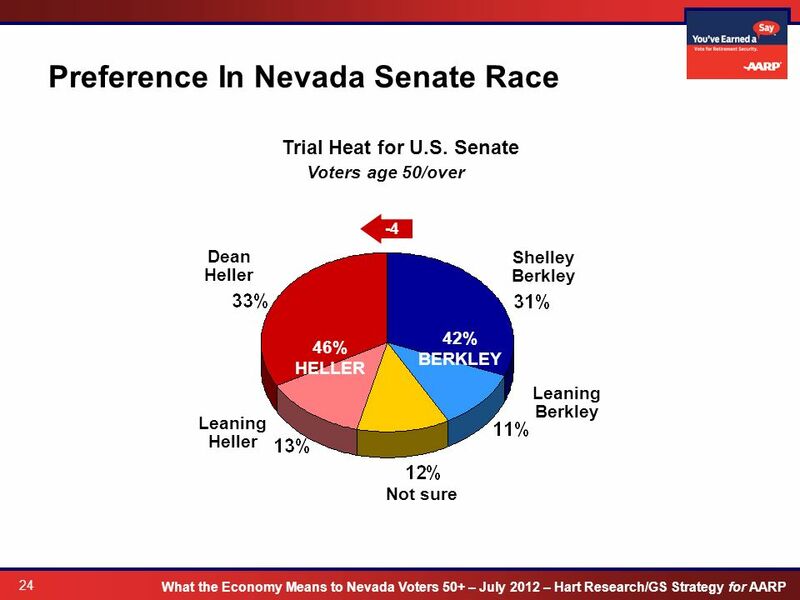 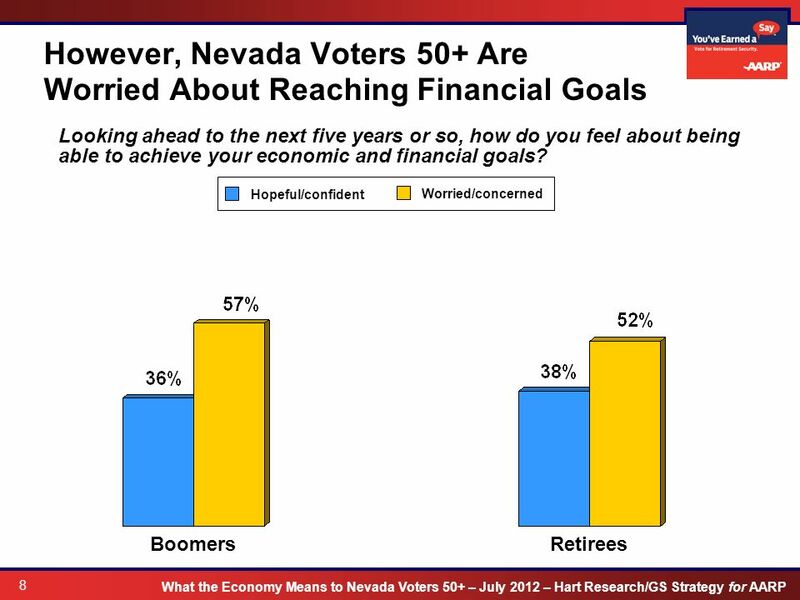 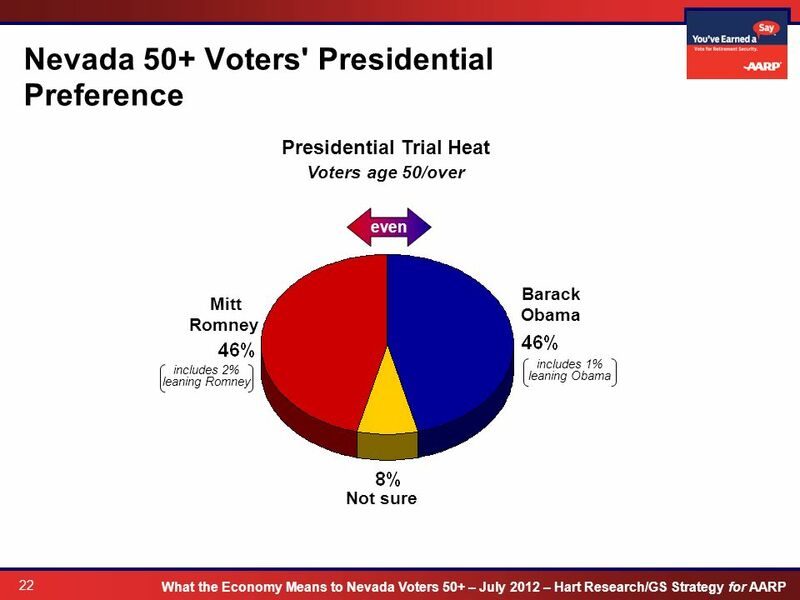 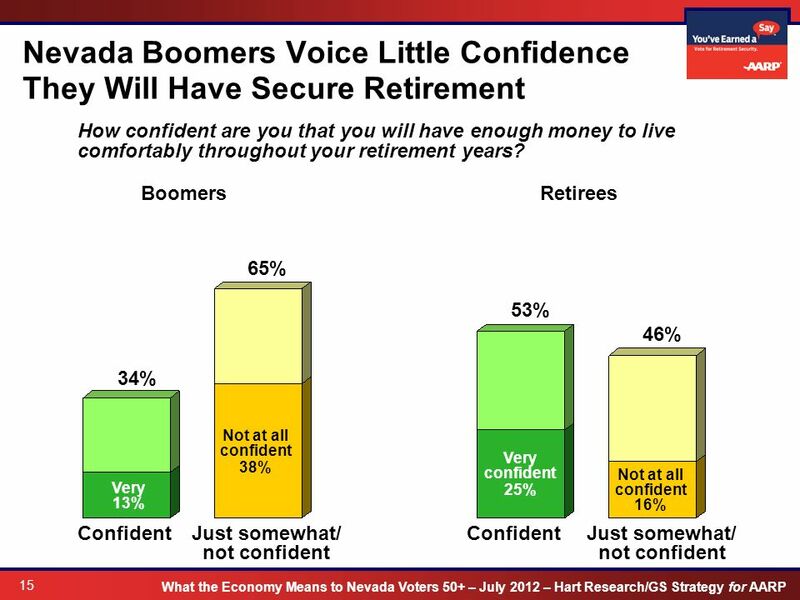 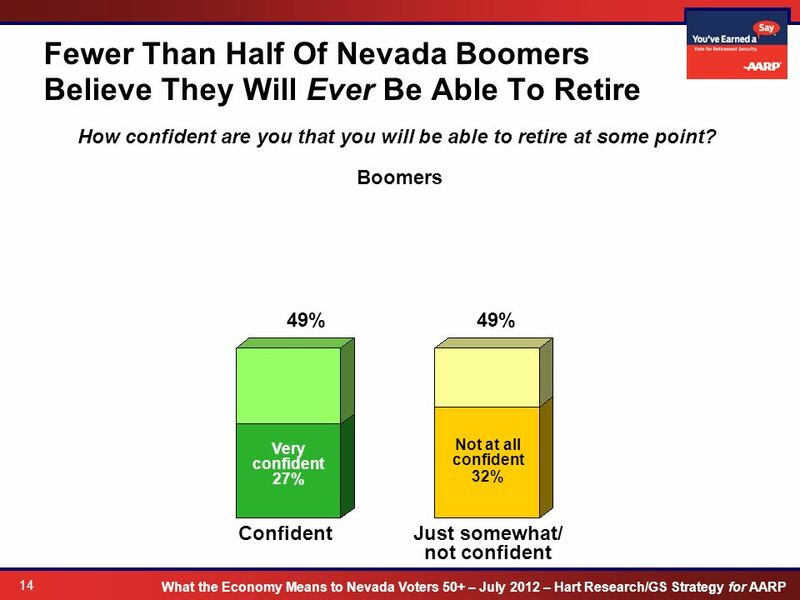 3 What the Economy Means to Nevada Voters 50+ – July 2012 – Hart Research/GS Strategy for AARP 3 Overview Non-retired Boomers in Nevada feel great economic anxiety across party lines. 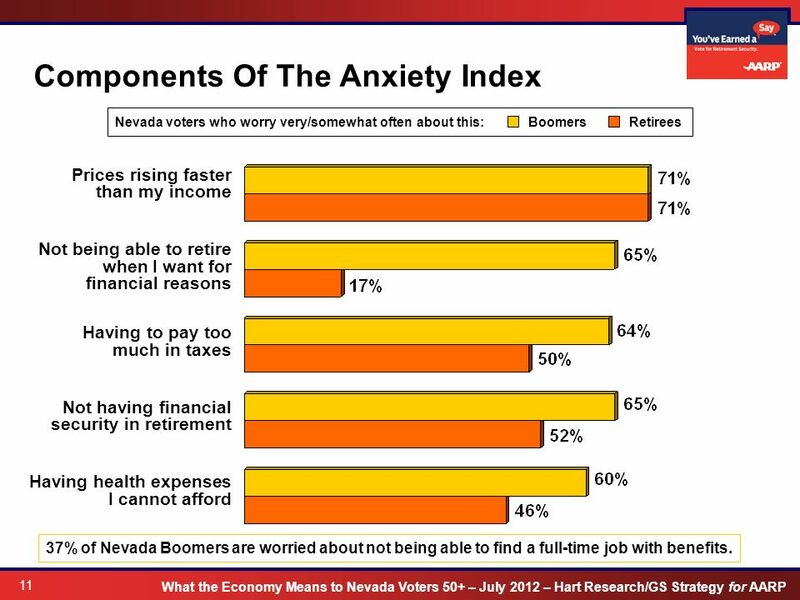 This is reflected in a new Anxiety Index that measures their worries on such issues as prices rising faster than incomes, health expenses, and retirement security. 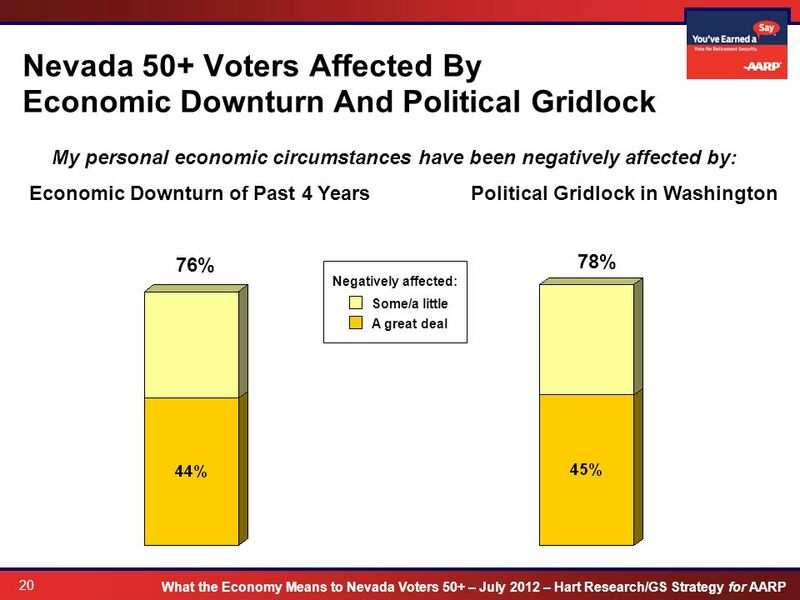 They also feel that political gridlock negatively affects their economic circumstances. 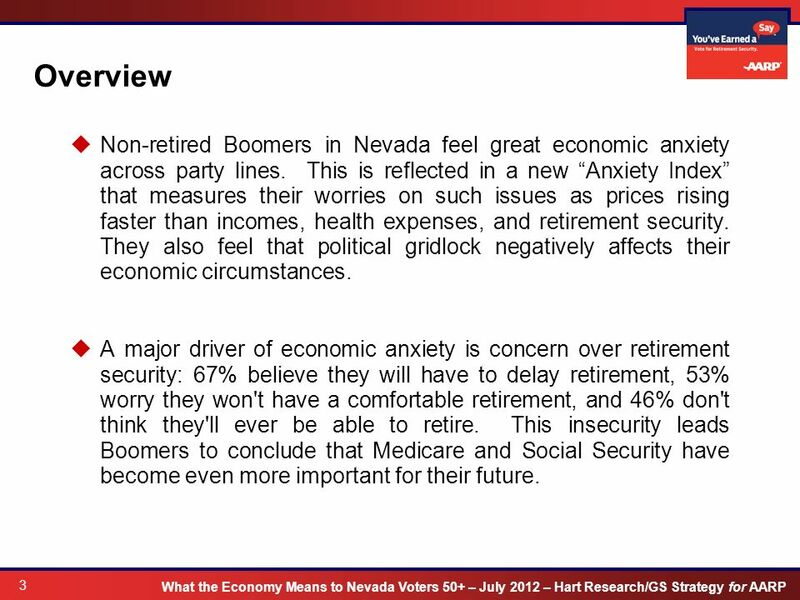 A major driver of economic anxiety is concern over retirement security: 67% believe they will have to delay retirement, 53% worry they won't have a comfortable retirement, and 46% don't think they'll ever be able to retire. 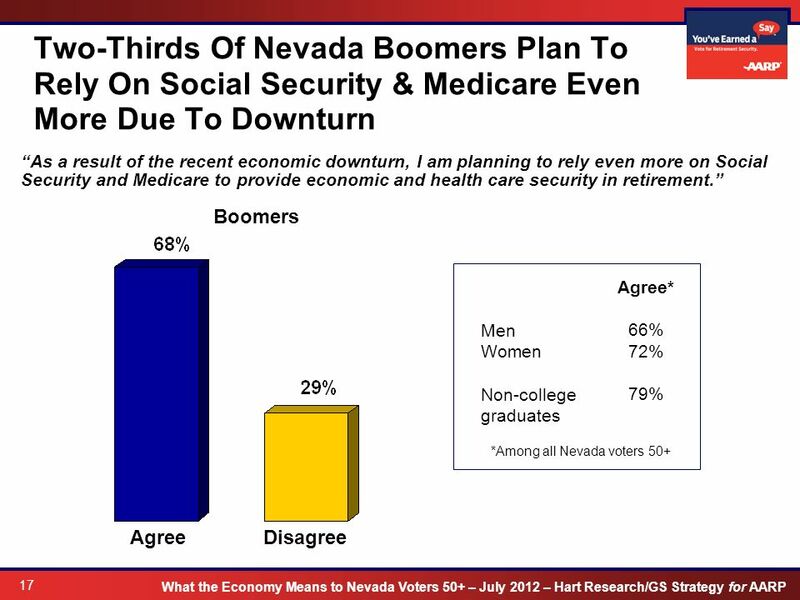 This insecurity leads Boomers to conclude that Medicare and Social Security have become even more important for their future. 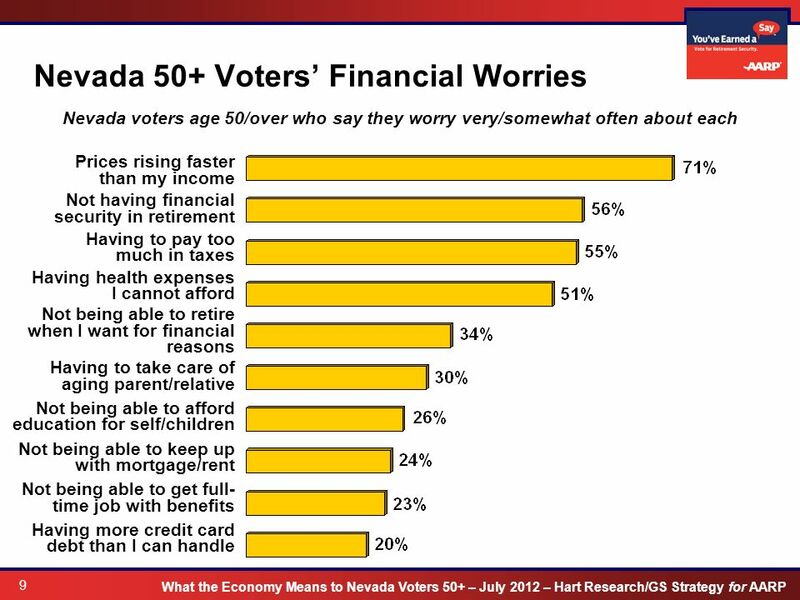 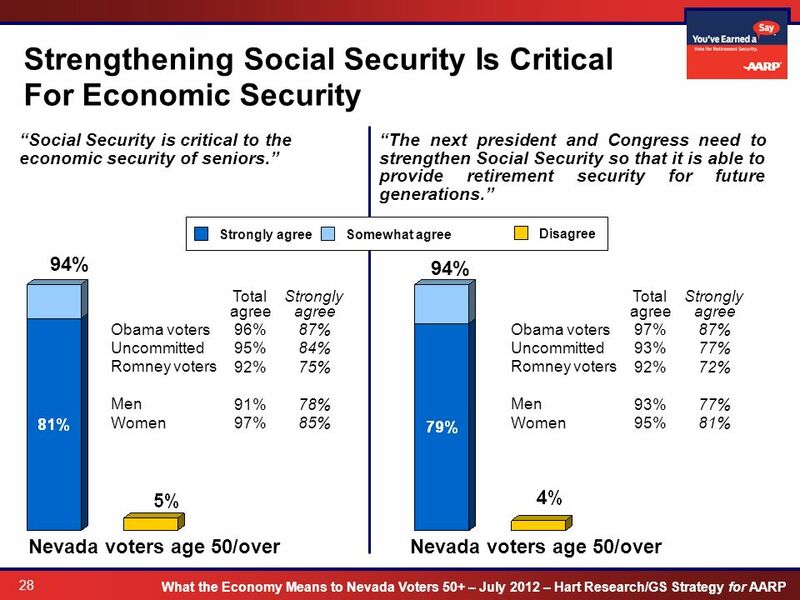 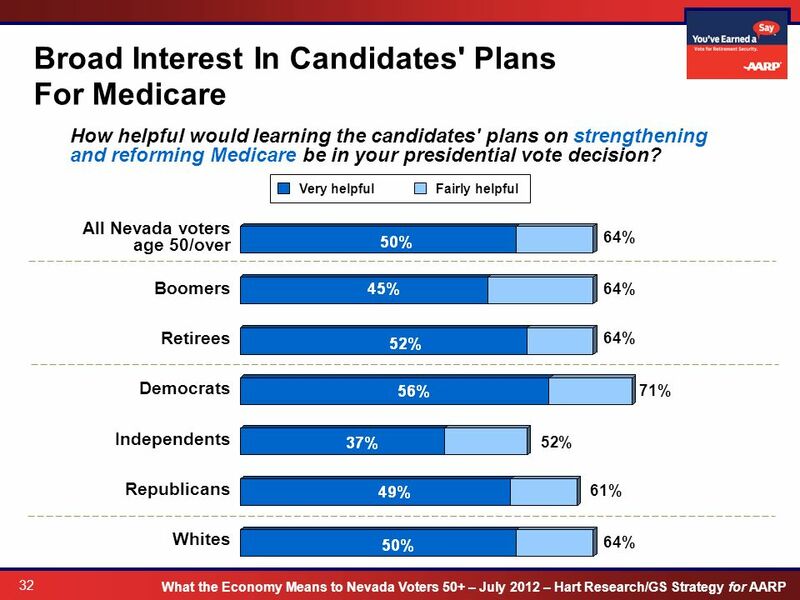 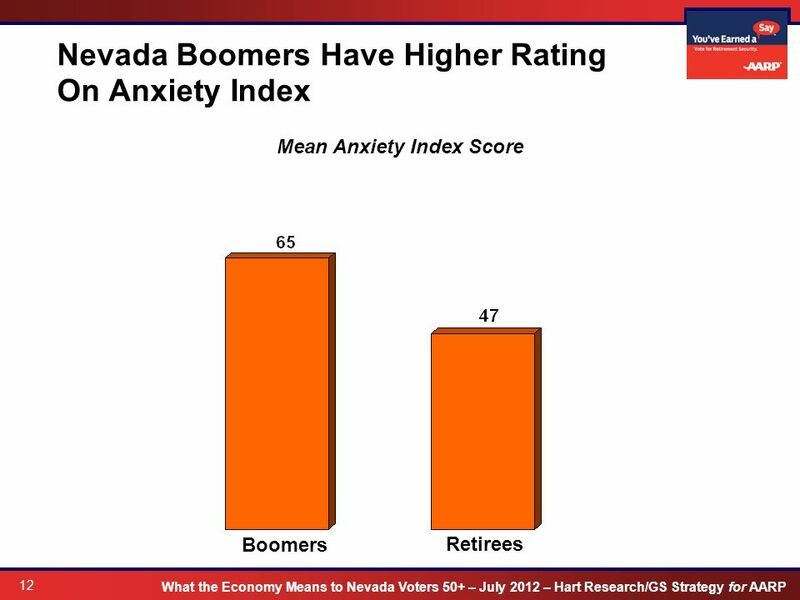 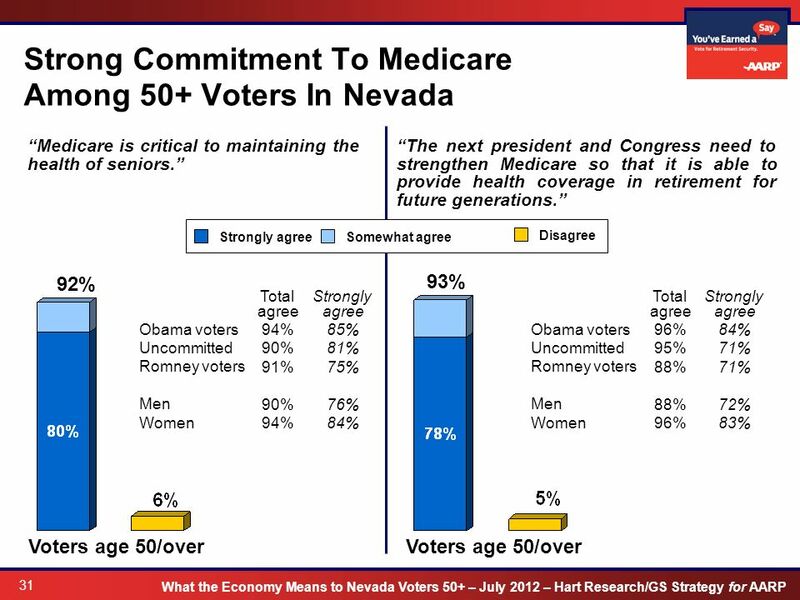 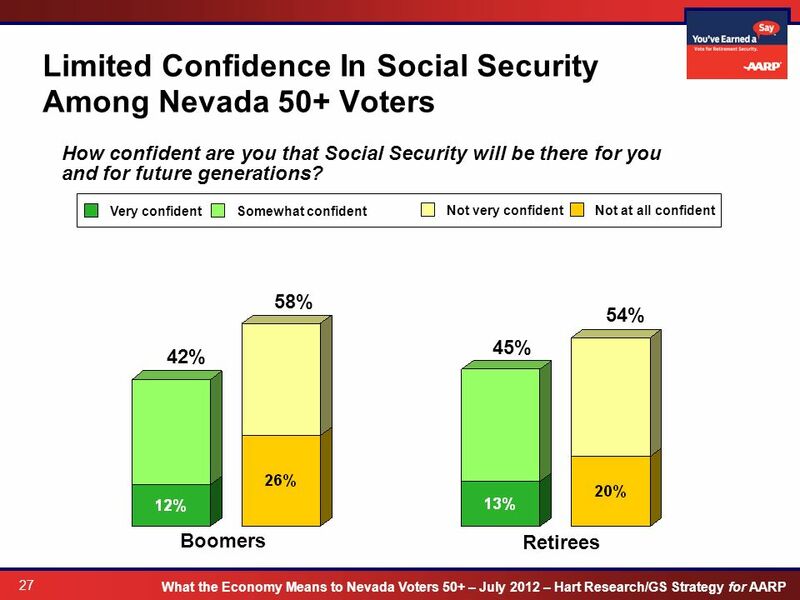 4 What the Economy Means to Nevada Voters 50+ – July 2012 – Hart Research/GS Strategy for AARP 4 Overview (continued) This anxiety underscores the importance of strengthening Medicare and Social Security for current and future generations. 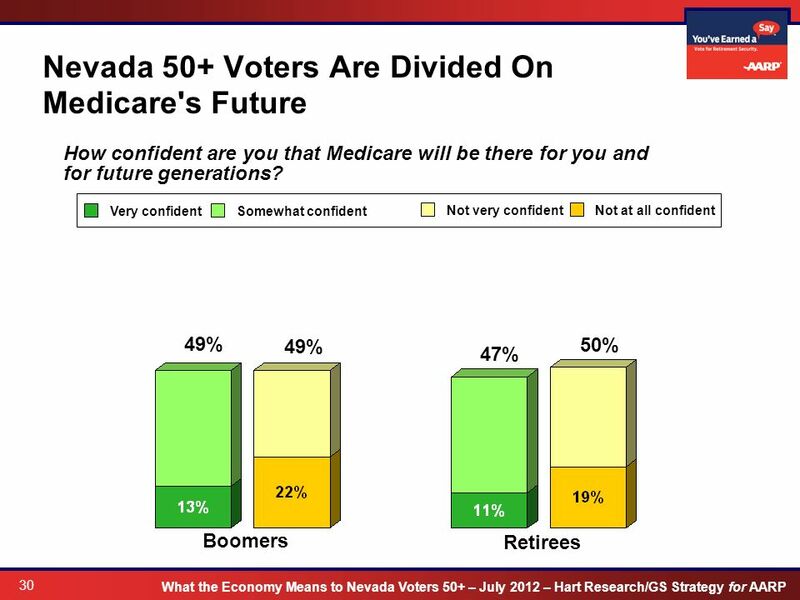 Voters 50+ believe the next president and Congress will need to act to strengthen Medicare and Social Security for the future, and that both parties will have to come together to find a solution. 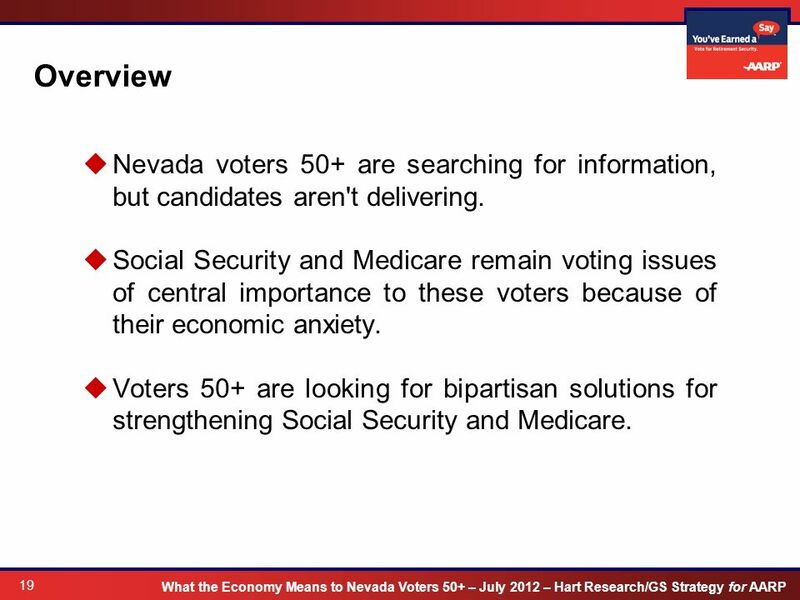 50+ voters in Nevada want to know where the candidates stand on Medicare, Social Security, and other vital issues. 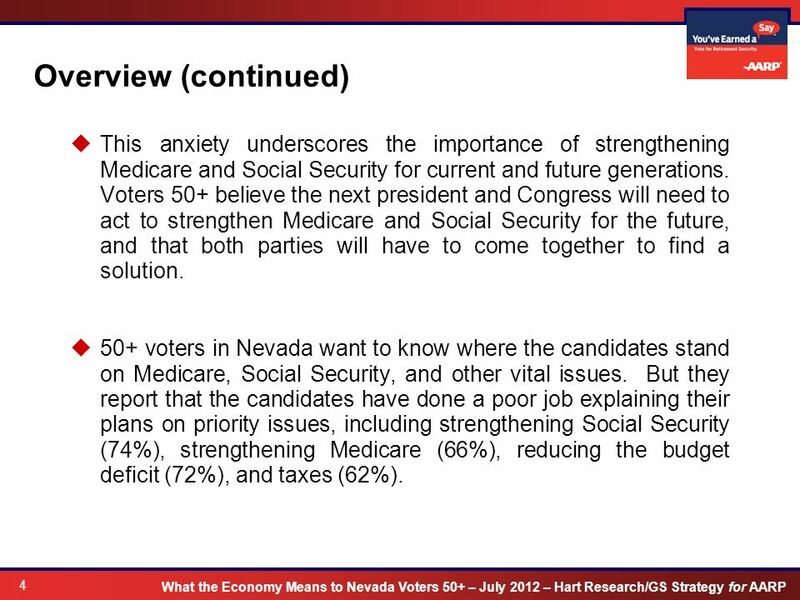 But they report that the candidates have done a poor job explaining their plans on priority issues, including strengthening Social Security (74%), strengthening Medicare (66%), reducing the budget deficit (72%), and taxes (62%). 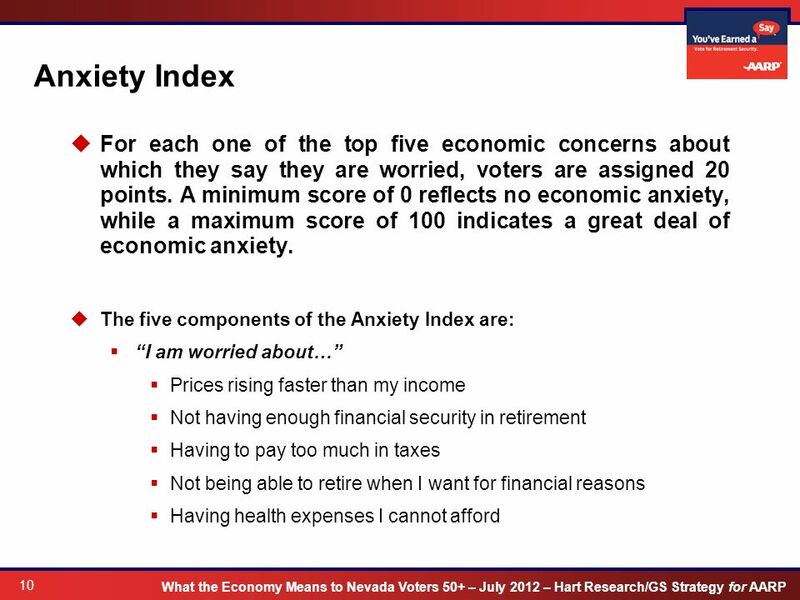 11 What the Economy Means to Nevada Voters 50+ – July 2012 – Hart Research/GS Strategy for AARP 11 Components Of The Anxiety Index Prices rising faster than my income Not being able to retire when I want for financial reasons Having to pay too much in taxes Not having financial security in retirement Having health expenses I cannot afford Nevada voters who worry very/somewhat often about this:BoomersRetirees 37% of Nevada Boomers are worried about not being able to find a full-time job with benefits. 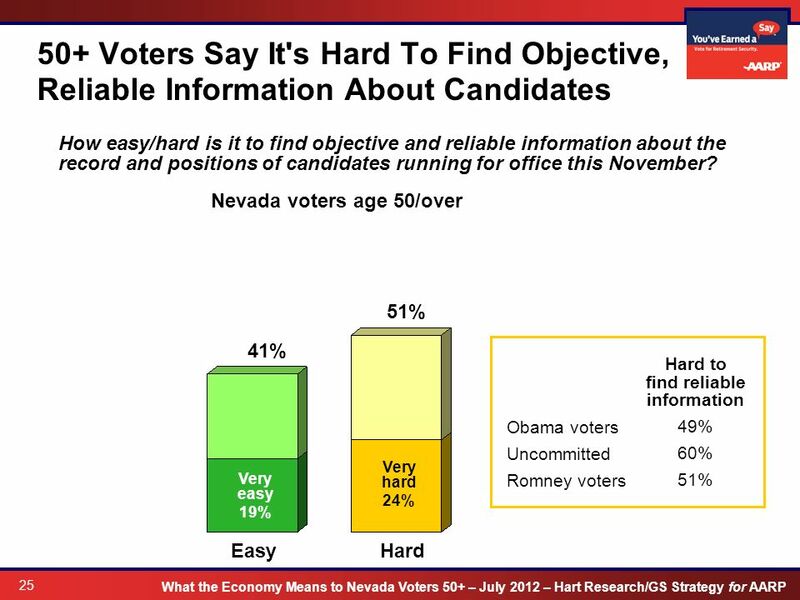 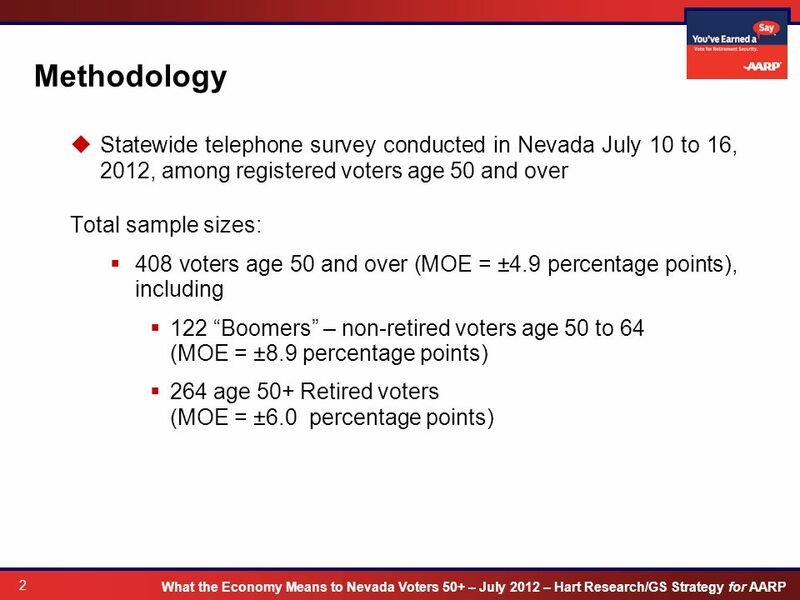 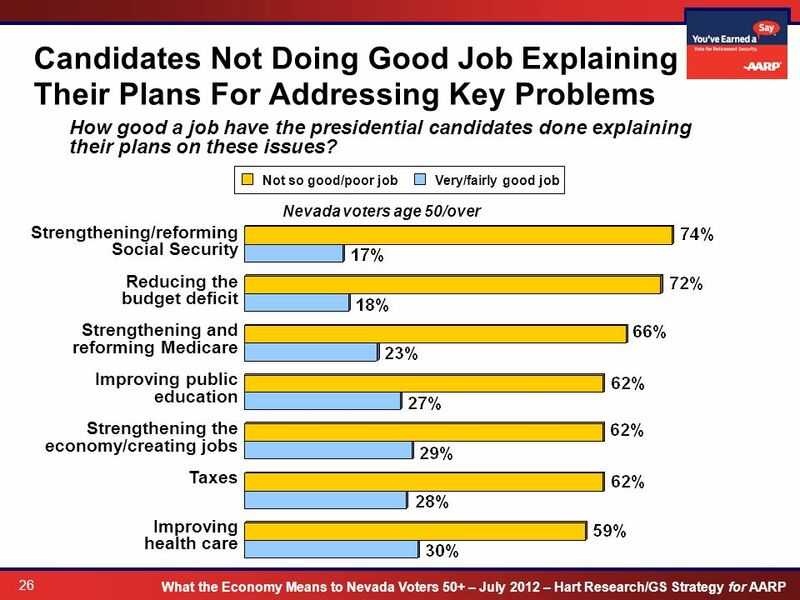 19 What the Economy Means to Nevada Voters 50+ – July 2012 – Hart Research/GS Strategy for AARP 19 Overview Nevada voters 50+ are searching for information, but candidates aren't delivering. 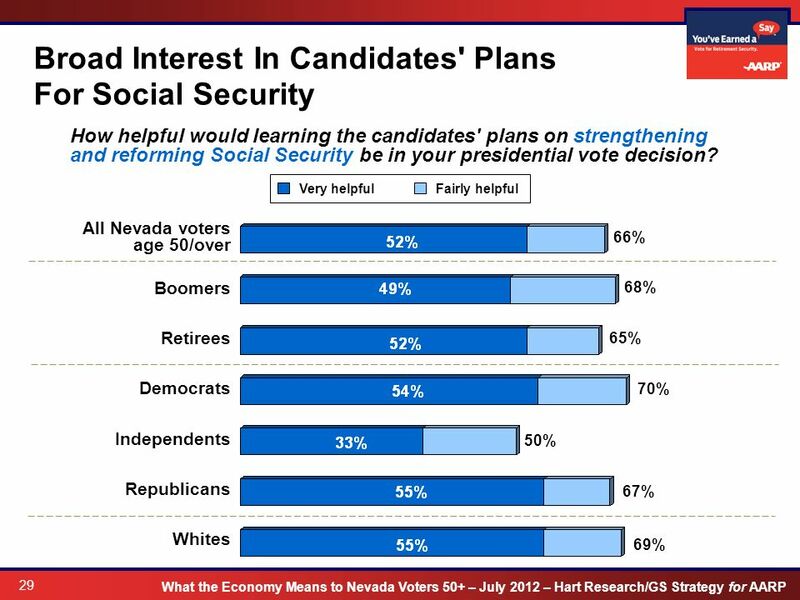 Social Security and Medicare remain voting issues of central importance to these voters because of their economic anxiety. 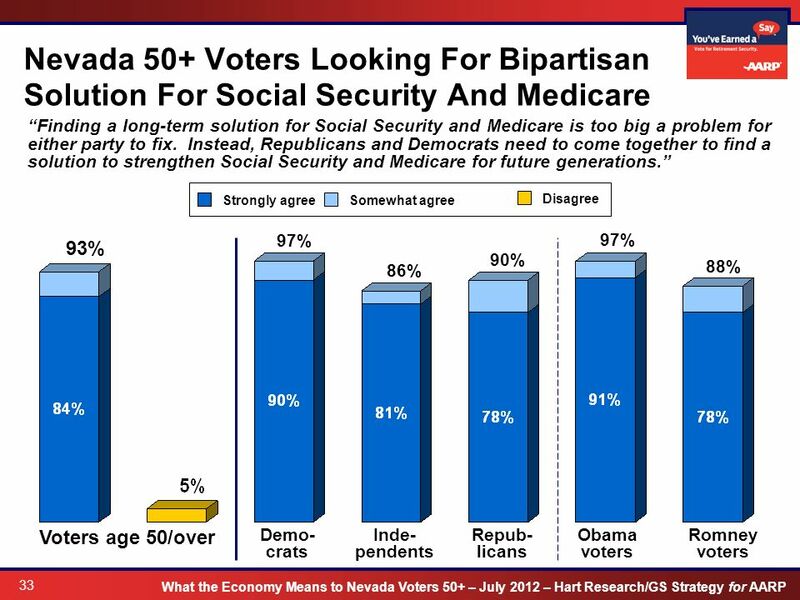 Voters 50+ are looking for bipartisan solutions for strengthening Social Security and Medicare. 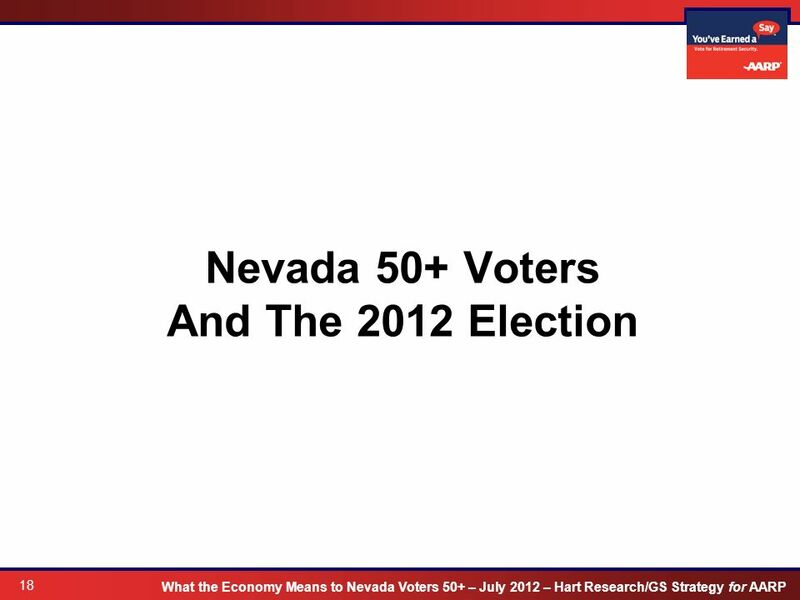 Download ppt "What The Economy Means To Nevada Voters 50+ Key findings from survey conducted July 2012 for HART RESEARCH ASSOTESCIA." 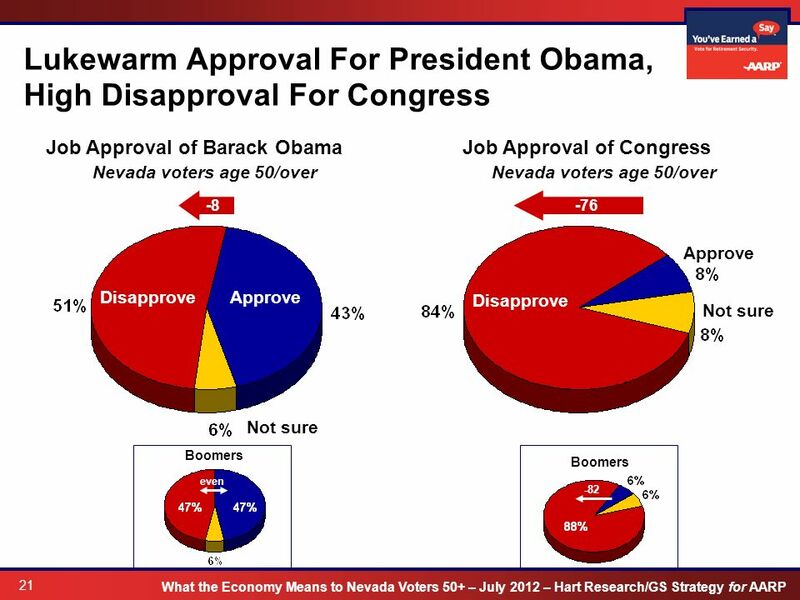 1 September North Lee Street, Suite 400 · Alexandria, Virginia · · FAX Public Opinion on Coverage for the Uninsured.